A. Thorburn, Gamebirds and Wildfowl of Great Britain and Ireland, London, 1923, p. 57, pl. 23. J. Southern, Thorburn's Landscape: The Major Natural History Paintings, London 1981, pl. XXXVIII opp. p. 86 (illustrated in colour). J. Southern, Thorburn's Birds & Mammals, London, 1984, opp. p. 80 (illustrated in colour). 'A painting full of movement: from the fast-flowing sky to the rising duck and the choppy sea, the scene is convincingly alive and on the move. 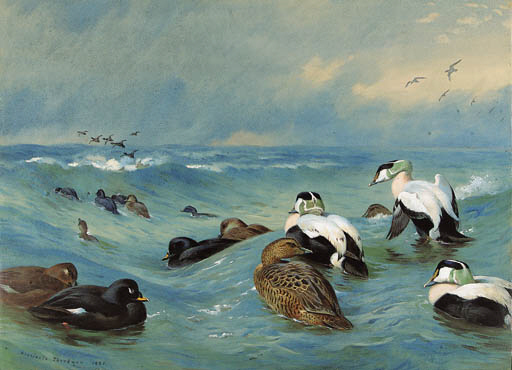 Painted as an illustration for one of his own books, Gamebirds and Wildfowl of Great Britian and Ireland, published in 1923, Thorburn achieves his ambition as outlined in his introduction to the book in which he states: 'My aim in this work has been to represent these birds grouped in their natural surroundings rather than to make scientific plates of the species.'' (J. Southern, 1981, op. cit. p. 86).